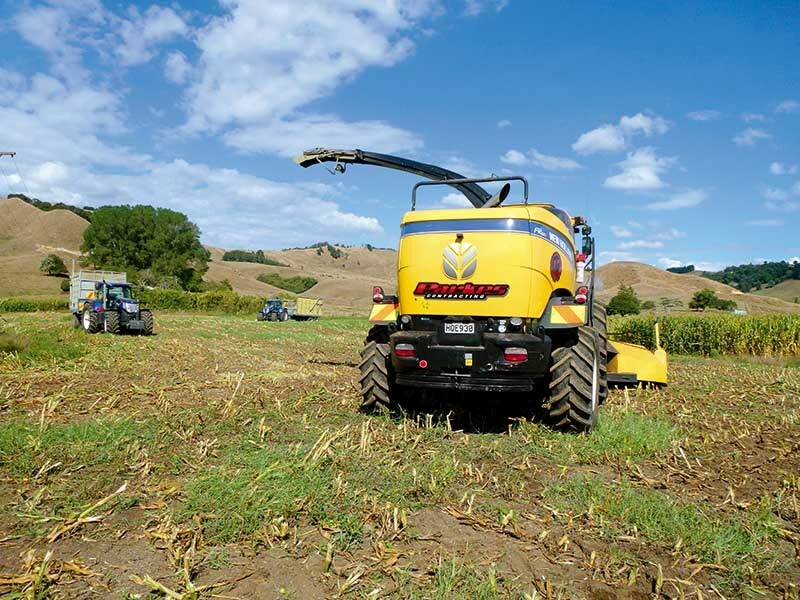 Farm Trader machine tester Brent Lilley reviews the New Holland FR600 forage harvester. 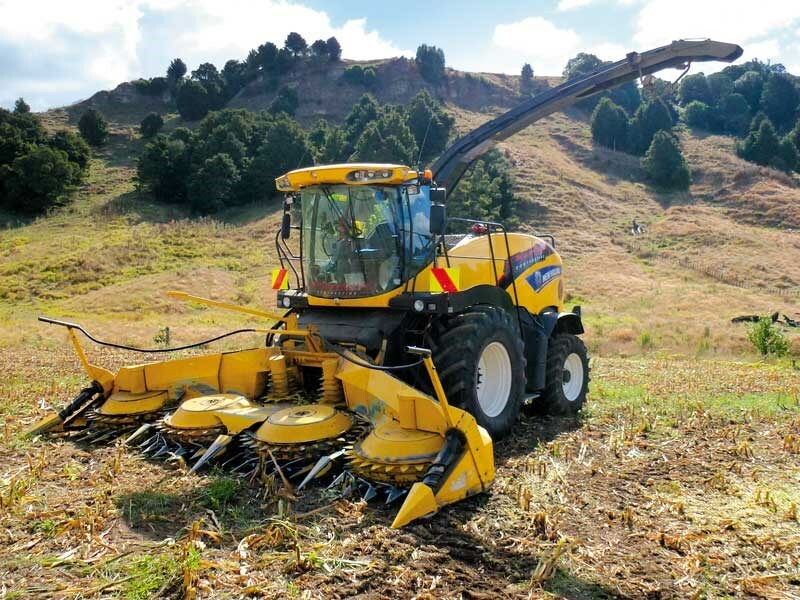 The New Holland FR600 harvester is owned by Dean Parkes of Parkes Contracting that operates from near Te Awamutu in the Waikato. 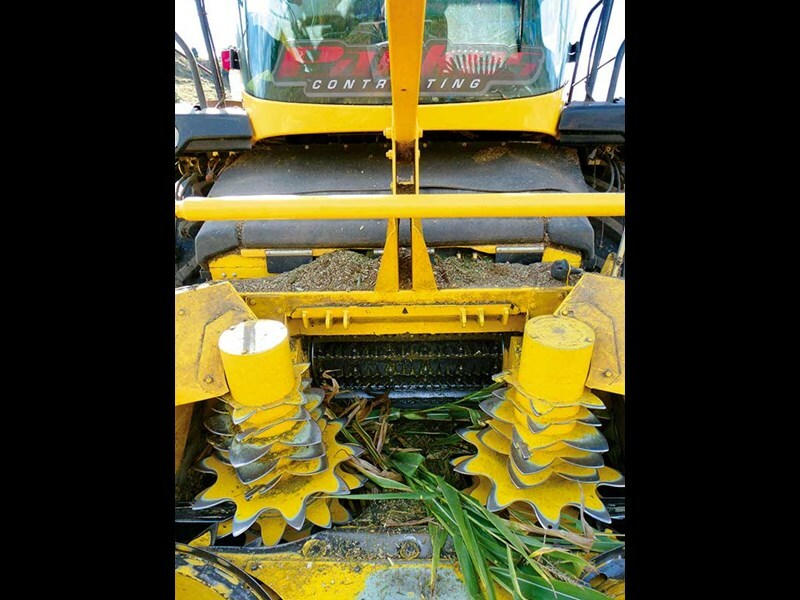 It arrived last September to replace an FR9060 and when I caught up with it in the middle of their busy maize season, it was closing in on 2000 hectares of work. Feed rollers serve two important purposes. Firstly they compress the crop into a uniform mat to ensure precise cutting and secondly they feed the crop in at an even speed to produce uniform chop length. New Holland has the widest feed rollers and chopping cylinder on the market and this means that material is fed to the cutting cylinder in a wider thinner mat, which along with the HydroLoc drive system produces a precise uniform feeding and therefore length of chop. One improvement from the earlier model, which I was pleased to see, was further plates and guards around the feed rollers which keep material in the feed channel, preventing excess build up around the front of the machine. The HydroLoc system uses a hydraulic motor to drive the gear box on the feed rollers and power them separately of the cutting cylinder. This drive setup means the speed of the feed rollers and therefore the length of chop is infinitely variable from the cab. Double drive, an option fitted on Parkes machine, uses an additional hydraulic drive motor to drive the header. 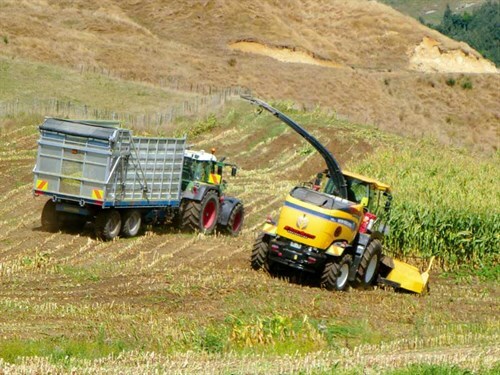 Metal detectors are a must on a modern chopper and the problem with finding the metal in the crop when it is detected usually falls on the trailer driver beside the machine. 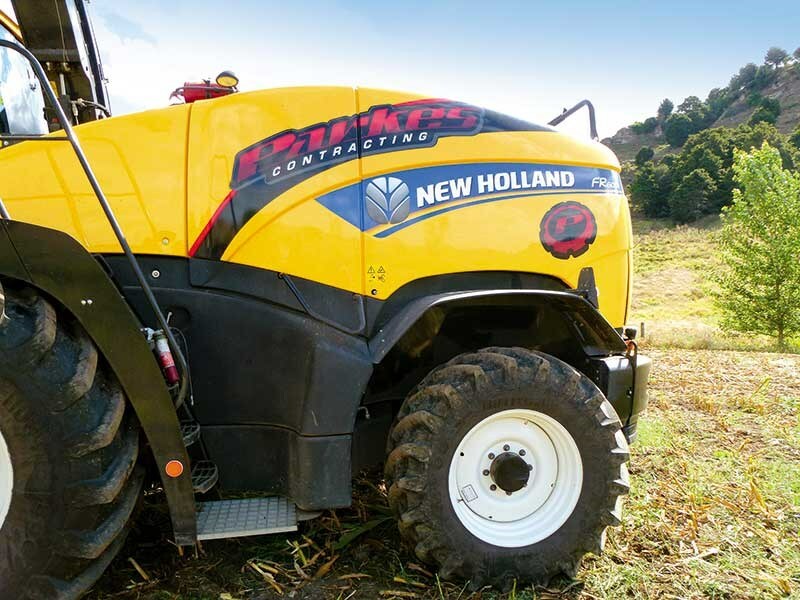 New Holland has again come up with some clever ideas to make the process as easy as possible. The feed rollers are divided into six separate detection zones and I’m told the MetaLoc system will bring the feed rollers to a halt in 0.003 seconds of detection with the help of the HydroLoc gearbox. The monitor in the cab then displays which section the detection is in, making it easier to find the metal across the wider width. The cutting cylinder is definitely the business end of the machine. Spinning at over 1000rpm, it can chew through a serious amount of material in a hurry. 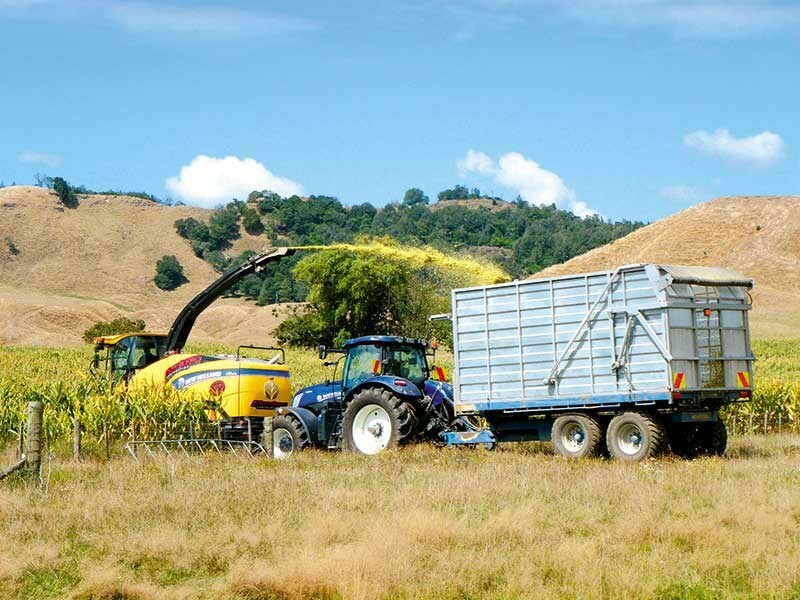 Not only does the New Holland have the widest chopping cylinder on the market at 884mm wide, but the whole feed channel from the feed rollers through the cutting cylinder and processer to the accelerator is also widened to enable the machine to process a larger quantity of material. Each knife is held to the cylinder with five bolts for safety. They are arranged in a chevron pattern for a smooth efficient scissor-like cutting action against the shear bar. There is an option for 12, 16 or even 20 knives each side of the cylinder. At more than 600kg, the New Holland cutting cylinder is also the heaviest available offering high inertia to prevent shock loads and gives the most uniform chop length. 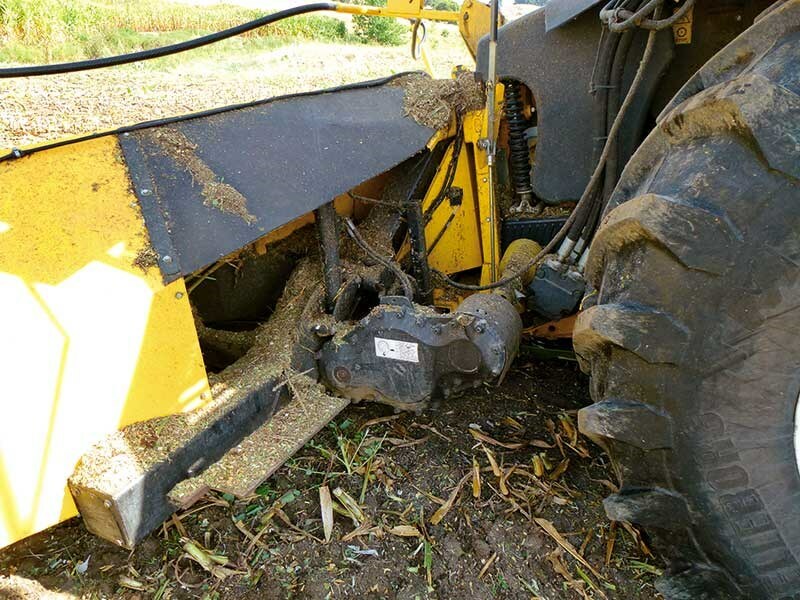 New Holland has had forward or reverse sharpening as an option for some time. It is a relatively simple setup with a hydraulic motor that simply turns the chopping cylinder in reverse before the sharpening cycle starts and the stone is draw across the top of the cylinder. The FR600 model sits in the middle of the range that starts at 450hp with five models up to the top 850hp monster. The engine is mounted longitudinally in the back of the machine over the rear axle and is a sizable inline six cylinder 12.9 litre FPT (Fiat Power Train) engine which is combined with a compound turbo to develop 600hp. The compound turbo system uses what is essentially another turbo driven by the first one which through some fancy engineering gives drive back onto the crankshaft. The engine delivers smooth power on demand and the compound turbo setup is said to decrease fuel consumption by around eight percent. An update from the first FR models is a two stage throttle. Push the engine rpm button once to go from an idle up to 1850 rpm then once more to full noise. Although a little unnerving to begin with, the option of 1850 rpm is great, as this is where the maximum power out of the engine is. It means that any time the engine is running at less the full capacity, it is using less fuel and as the load on the engine increases, it still increases its power to meet demand up to maximum capacity. Power Cruise is an interesting feature that definitely takes a little getting used to. It essentially uses engine management software to control the forward speed of the machine when it is turned on. The driver can set up the target forward speed usually just slightly faster than the max possible speed and the minimum engine rpm somewhere just under 1800rpm. It will ensure the machine stays at full capacity at all times and in my past experience it worked very well in even crops such as maize. In crops like grass with heavy and light patches in the row, the machine would speed up and slow down excessively, which is a good sure way to annoy trailer drivers. 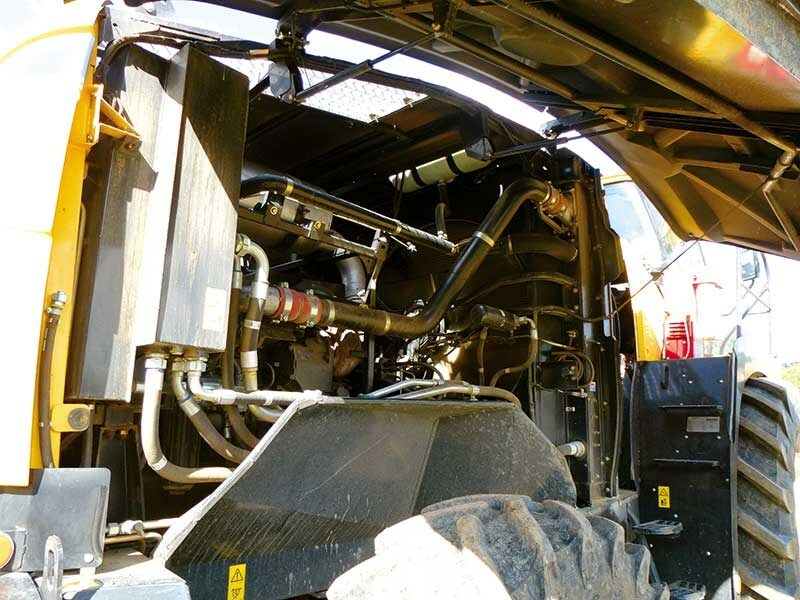 When the heat is on drivers end up spending long hours in the seat and a well-designed cab can make all the difference at the end of the day. The cab is unchanged and designers have stuck with the rounded "fish bowl" cab which was introduced on the first FR models – although it has gained some extra sound deadening underneath to make it even quieter for the operator. The cab is roomy and gives amazing visibility with almost 360 degree views of the header and the trailer whether loading on the left, right or opening up behind. The driver is positioned in the centre of the machine on a comfortable air ride seat. The controls are largely unchanged and the console is combined into the right hand arm rest of the seat with all the controls laid out in a row of clearly labelled toggle switches which places everything at the operator’s finger tips. Up front of the console, a joystick is used to control the movement and direction of the machine. Buttons on top are all with easy reach of your thumb when your hand is on the joystick. 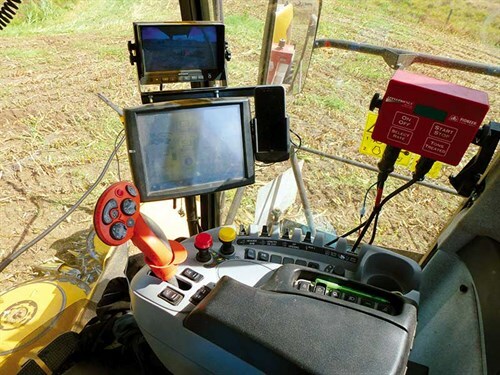 Automatic functions built into the controls include power cruise activation, preset header heights and spout positions. When it comes to control of the shoot, I’ve been in some lengthy discussion of which is right: should the shoot move to the front or the back when the button is pushed left? 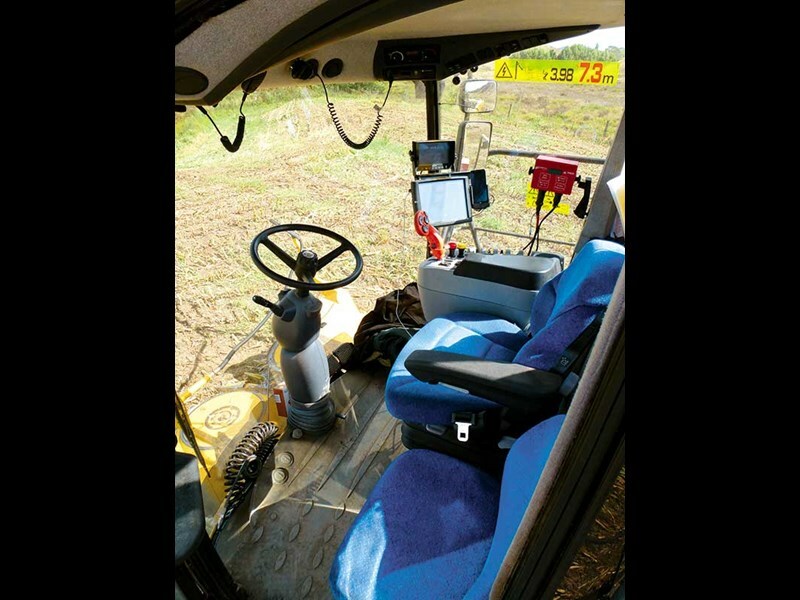 Well, New Holland realise this and the controls can be inverted in the settings on the monitor which saves changing hoses over if you have more than one operator. One of the few controls not on the arm rest is the raise and lower of the shoot which is found on the floor to the left of the steering column. While this may seem odd to those without any previous experience in a New Holland, it works very well once you get used to it. Read the full review in the latest issue (#220) of Farm Trader magazine. Subscribe here. 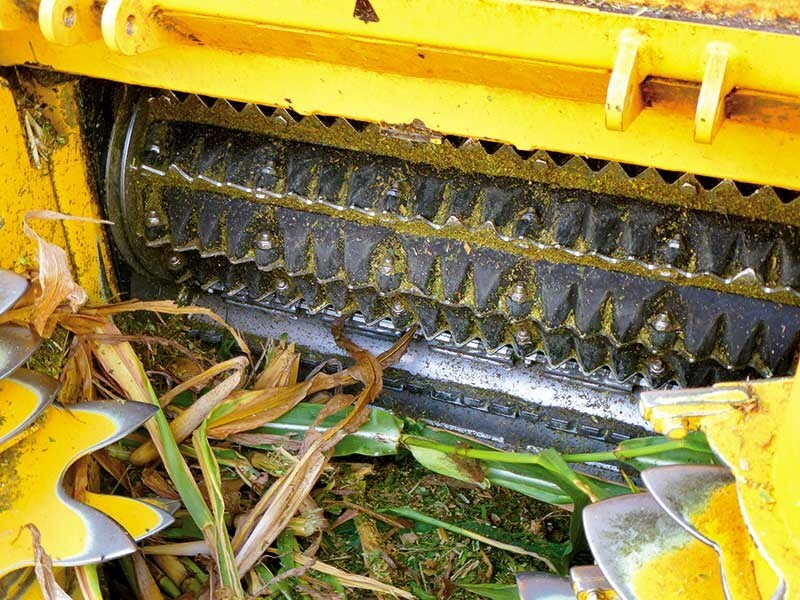 Check out this video of the NH FR600 forage harvester in action.